Welcome to Blog 3 in the Simple Time Rests Series. In Blog 3, we will look at the Basic Beat Breakdown. We will explore how we Breakdown the pulses in each Basic Beat in order to make adding multiple rests easy! In Blog 1, we studied the Basic Beat and using the Basic Beat Pulses to add rests in Simple Time. In Blog 2, we looked at a fun way to understand the "balance of the pulse" and why we do not use dotted rests in Simple Time. 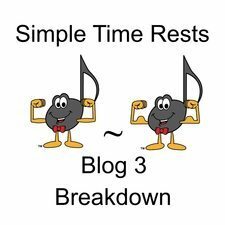 If you did not read Simple Time Rests Blog 1 - Basic Beats or Simple Time Rests Blog 2 - No Dotted Rests, please take a moment to read them now before exploring how each Basic Beat breaks down into 4 "Breakdown Pulses". Rests have Rules. These Rules are based on the Pulse. A Strong Pulse will join a Weak Pulse into one rest. A Medium Pulse will join a Weak Pulse into one rest. A Weak Pulse will not join a Medium Pulse. You must use 2 separate rests. A Weak Pulse will not join a Weak Pulse. You must use 2 separate rests. A Whole Measure of Silence in Simple Time is a Whole Rest (except in 4/2 Time). Do not use dotted rests in Simple Time. The Top Number of a Time Signature indicates how many Basic Beats there are in each measure. If the Top Number is 4, the Time Signature has a Quadruple Pulse (Strong - weak - Medium - weak). The Bottom Number of a Time Signature indicates the value of the note that receives one Basic Beat. In Simple Time, the "magic number" is 4. Every Basic Beat can break down into (or be divided by) 4. This is called the Breakdown of the Basic Beat. In Compound Time, the "magic number" is 3. This is why we can use dotted rests only in Compound Time. When a Basic Beat requires rests to be a complete Basic Beat, use the Breakdown Pulse to add the rests. You must complete that Basic Beat before going to the next Basic Beat. An eighth note breaks down into 4 thirty-second notes (which have a pulse of Strong - weak - Medium - weak). When a Basic Beat is not complete and we have to add rests, we need to look at the pulse of the Breakdown of each Basic Beat. When adding rests, we must always complete each Basic Beat with the necessary rests before going to the next Basic Beat. Always follow Rules #1 to #4 when adding multiple rests! Remember - since Simple Time Rest Rule #6 states that we do not use dotted rests in Simple Time, we simply use more than one rest! We explored the reason behind this in Blog 2 of this series. Please note that I have specifically NOT joined the flags of the eighth notes (above), sixteenth notes (below) and thirty-second notes (3rd example) to make it easier for you see the single note values. What is important is to see how each note can break down into 4 breakdown beats! Remember: when adding rests, we must always complete each Basic Beat with the necessary rests before going to the next Basic Beat. You cannot combine some rests from one Basic Beat and some rests from the next Basic Beat. Can you identify which measures have the rests added Correctly and which are Incorrect? 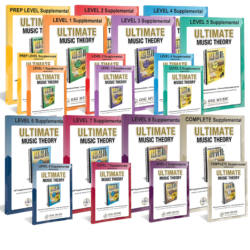 Purchase the Ultimate Music Theory Complete Music Workbook and Answer Book. Work through each page in the workbook and mark yourself with the Answer Book. So many teachers have told me that they didn't realize how many concepts they were teaching incorrectly (or didn't understand) until they completed this Workbook themselves. I can just about guarantee you that you will learn something new! 2. Take the Ultimate Music Theory Certification Course. If you have a passion for teaching (any instrument, including voice! ), the materials that you will learn will blow you away! This course is more than just Theory - it is a Pedagogically based Certification Course that will make you a better teacher - guaranteed! If you are a student and these "Simple Time Rest Rules" are new concepts for you, please consider taking the Complete Music Theory Online Course. Using video lessons, Glory St. Germain will teach you the Complete Rudiments Workbook! You will have all the tools you need to learn Music Theory! Thank you so much Glory and Shelagh for this lesson. It is more simplified and easy for kids to understand.